One of the most brutal wars in recent history, World War I resulted from a chain of events following the assassination of the Austro-Hungarian Archduke Franz Ferdinand on June 28, 1914. Aircraft were used in warfare for the first time. 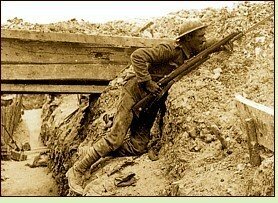 Soldiers on Europe's Western Front fought in cramped, muddy trenches under continual threat of death. The inhuman conditions and constant fear caused many to suffer from what was then called "shell shock." This period also witnessed the defeat of the Ottoman Empire and the horrors of the Armenian genocide. Toward the end of the war, a worldwide epidemic of a virulent strain of influenza broke out, killing soldiers and civilians alike with shocking speed. This page lists novels about European and Australian soldiers and auxiliary personnel such as nurses. Settings may be on the eve of the war, during the war and in its aftermath. A few classic novels written during or after the war based on the authors' own experiences are listed. These are not true historical novels, since they were contemporary at the time they were written; a comprehensive listing of contemporary WWI novels is outside the scope of this website. Click on the title for more information from Powell's Books or another online source, or if you're outside the U.S., try The Book Depository. Lyn Andrews, Angels of Mercy (1998), about two pretty young British women, twins, who join the Voluntary Aid Detachment and go to work at the front. Pat Barker, Regeneration (1991), a novel about Siegfried Sassoon, who was sent to a mental hospital after he concluded World War I was a senseless slaughter; #1 in the Regeneration trilogy. Pat Barker, Eye in the Door (1993), about a psychiatrist who treats soldiers for shell shock; #2 in the Regeneration trilogy. Pat Barker, The Ghost Road (1995), about a psychiatrist who treats soldiers for shell shock, a soldier he treated, and the poet Wilfred Owen; #3 in the Regeneration trilogy. Pat Barker, Life Class (2008), about three London art students and the choices they make when World War I breaks out; #1 in the Slade School trilogy. Pat Barker, Toby's Room (2012), about a medical student posted to the front in World War I and his sister, an art student determined to find out what has happened to him after he is reported missing in action; #2 in the Slade School trilogy. Pat Barker, Noonday (2015), about a group of artist friends coping with the Blitz in 1940 London; #3 in the Slade School trilogy. Sebastian Barry, A Long, Long Way (2005), about an Irish soldier during World War I.
Rosalind Belben, Our Horses in Egypt (2007), about an English horse requisitioned to serve in Egypt during World War I, and her owner, a war widow, who goes in search of the horse after the war. Maggie Bennett, The Carpenter's Children (2009), about a young man who goes to fight in World War I despite his pacifist beliefs, while his two sisters struggle with marriage, romance, child-rearing and financial difficulties at home in England. Stewart Binns, The Shadow of War (2014), about five British communities affected by the outbreak of World War I; #1 in the Great War series. Stewart Binns, The Darkness and the Thunder (2015), about five British communities during the war year of 1915; #2 in the Great War series. Emma Blair, Forget-Me-Not (2001), historical romance about an actress and a journalist who becomes a pilot in the RAF. William Boyd, An Ice Cream War (1982), about British East Africa during World War I.
Diney Costeloe, The Lost Soldier (2016), about the love of two young people thrown together by the outbreak of World War I, and the small-town reporter in Dorset who uncovers their story. Colin E. Demet, Iolaire and the Beasts of Holm (2009), about the wreck of the British naval vessel Iolaire on the rocks known as the Beasts of Holm off Stornoway Harbor in the Hebrides on New Year's Day 1919 with almost 300 returning servicemen aboard; not readily available in the U.S.
Margaret Dickinson, Suffragette Girl (2009), about a suffragette who signs up to serve as a nurse when the First World War begins. David Downing, Jack of Spies (2014), about a Scottish car salesman who becomes a spy for the British Navy in 1913. Marc Dugain, The Officers’ Ward (2000), about a young officer disfigured by a German shell. Nigel Farndale, The Blasphemer (2010), a dual-time novel about a present-day couple who experience a crisis of faith when their plane crashes near the Galapagos Islands, and the husband's great-grandfather, who fought in the trenches during World War I.
Sebastian Faulks, Birdsong (1993); about an English soldier in World War I who rekindles his love affair with a Frenchwoman whose husband abuses her; #2 (by publication date) in a loosely connected trilogy beginning with The Girl at the Lion D'Or and ending with Charlotte Gray. Alexander Fullerton, The Blooding of the Guns (1976), about the British Royal Navy during the Battle of Jutland in 1916; #1 in the Nicholas Everard series. Alexander Fullerton, Sixty Minutes for St. George (1977), about a young sub-lieutenant in the Royal Navy and his experiences in the 1918 raid on Zeebrugge; #2 in the Nicholas Everard series. Alexander Fullerton, Patrol to the Golden Horn (1978), about a seemingly suicidal submarine mission through the Dardanelles during the last days of the war; #3 in the Nicholas Everard series (the series continues with novels set during World War II). Alexander Fullerton, Flight to Mons (2003), a stand-alone novel about a young British pilot who goes to France on an intelligence mission. Ron Graham, Flight of Youth (1997), about a young man who progresses from air mechanic to pilot in the RAF during the First World War. Hilary Green, Daughters of War (2011), historical romance about a young woman who joins the FANY program and is sent to Bulgaria, where she meets a dashing Serb; #1 in the Leonora trilogy. Hilary Green, Passions of War (2012), historical romance about a young woman in the FANY program who is in love with a man promised to another; #2 in the Leonora trilogy. Holly Green, Frontline Nurses (2018), historical romance about a wartime nurse who disguises herself as a man to avoid the difficulties women face on the battlefield, but then finds herself falling for a dashing colonel; #1 in the Frontline Nurses series. Nicholas Griffin, Dizzy City (2007), about an English deserter trying to escape his memories of war by becoming a con man in New York. Ray Grover, March to the Sound of the Guns (2008), about five New Zealand soldiers during the campaigns of Gallipoli and the Western front. Susan Hill, Strange Meeting (1971), about a young British soldier and the dislocation the war causes in his life. Marjorie Jones, The Lighthorseman (2006), about the effects of war on Australian men who served as soldiers. James Long, The Balloonist (2014), about a British balloonist during World War I who must make a decision that could endanger the woman he loves. David Malouf, Fly Away Peter (1984), about two Australian soldiers. Douglas Reeman, The Last Raider (1963), about the captain of a World War I German commerce raider, a ship whose goal is to harass enemy merchant ships and disrupt commerce. Douglas Reeman, The Horizon (1993), about a young man serving in the Royal Marines during World War I; #3 in the Royal Marines Saga. I.D. Roberts, Kingdom Lock (2014), about a British spy sent to Persia in 1914 to protect the oilfields from German interference, where he encounters a young woman in desperate peril; #1 in the Kingdom Lock series. I.D. Roberts, For Kingdom and Country (2015), about a British spy in the Middle East during the British "Townshend's Regatta" attack and capture of Amara in 1915; #2 in the Kingdom Lock series. Derek Robinson, The Goshawk Squadron (1971), a tragi-comic novel about a British flight squadron in 1918; #1 in the Royal Flying Corps trilogy. Derek Robinson, War Story (1987), a tragi-comic novel about a British flight squadron; #2 in the Royal Flying Corps trilogy. Derek Robinson, Hornet's Sting (2000), a tragi-comic novel about a British flight squadron; #3 in the Royal Flying Corps trilogy. Jennifer Robson, Somewhere in France (2014), about a young woman who defies her aristocratic family to become an ambulance driver during World War I and is sent to France, where she falls in love with a man from a lower-class background. Robert Ryan, Empire of Sand (2008), about T.E. Lawrence (Lawrence of Arabia) and his activities in the Middle East during World War I.
Danny Scheinmann, Random Acts of Heroic Love (2009), about a modern man whose girlfriend dies in a bus crash in Ecuador and his grandfather, who escaped a Siberian POW camp during World War I and trekked across the frozen steppes to return to the woman he loved. Anita Shreve, Stella Bain (2013), about an American nursing aide suffering from shell shock and amnesia, and the London surgeon and his wife who take her in and become interested in her case. Elizabeth Speller, The First of July (2013; titled At Break of Day in the U.K.), about the Battle of the Somme from the perspective of four different men, two Englishmen, a Frenchman and an American. Roy Stolworthy, Coming Home (2012), about a fifteen-year-old soldier in the Yorkshire Rifles who took the identity of his conscripted brother after his brother died in an accident for which he blames himself. Vee Walker, Major Tom’s War (2018), about a British solicitor born in Bengal who enlists to fight in WWI after the death of his wife. Paul Watkins, In the Blue Light of African Dreams (1990), about a World War I flyer who deserts after being shot down, and dreams of becoming the first to fly nonstop across the Atlantic. Andrew Williams, The Suicide Club (2014), about a British military intelligence officer sent undercover to Field Marshal Haig's headquarters to spy on his fellow intelligence officers. Beatriz Williams, Overseas (2012), about a British soldier fighting in World War I and a present-day New York woman with whom he falls in love, as they travel between times. Mary Wood, All I Have To Give (2015), about a female surgeon who goes to the Somme, where, amid the brutality of the front, she meets and is attracted to a corporal from the East End. Peter Yeldham, Barbed Wire and Roses (2008), about an Australian soldier who survives Gallipoli, and then mysteriously disappears, leaving behind a diary that helps guide his grandson in a quest to learn the truth about his fate. Louisa Young, The Heroes’ Welcome (2015), about two young couples whose marriages are challenged by the wartime traumas that have affected the husbands; sequel to My Dear, I Wanted to Tell You. This section lists a few classic World War I novels by authors who lived through the war. These are not true historical novels, and no attempt has been made to compile a complete list. John Buchan, The Thirty-Nine Steps (1915), a thriller about an "ordinary fellow" who becomes a spy for the British at the beginning of World War I; #1 in the Hannay series. John Buchan, Greenmantle (1915), a spy thriller about four men traveling through Europe in disguise during World War I to foil a German plot; #2 in the Hannay series. John Buchan, Mr. Standfast (1919), a spy thriller about a brigadier general recalled from active duty to go undercover to find a German agent operating in Britain near the end of the First World War; #3 in the Hannay series. John Buchan, Three Hostages (1919), a spy thriller about a retired British spy who returns to duty after learning of a dangerous plot; #4 in the Hannay series. Humphrey Cobb, Paths of Glory (1935), about a man who refuses an order to fire on his fellow soldiers during a battle. Manning Coles, Drink to Yesterday (1940), about a British teenager who lies about his age to enlist in the army and is recruited into the secret service. C.S. Forester, The African Queen (1935), a proper British spinster and the skipper of a broken-down boat try to make their way out of Africa in the midst of war. Frederic Manning, Her Privates We (1929; also titled The Middle Parts of Fortune), a novel of gritty realism about British soldiers of working class backgrounds in World War I.
Liam O’Flaherty, Return of the Brute (1929), about the trench warfare experiences of the Irish Guards; based on the author’s wartime experiences. Rebecca West, The Return of the Soldier (1918), about the family of a shell-shocked British officer who returns from the war with fond memories of a long-ago girlfriend and no memory of his wife. V.M. Yeates, Winged Victory (1934), about a young fighter pilot; based on the author's World War I experiences. Antonia Arslan, Skylark Farm (2007), about a family trying to survive during the 1915 Armenian genocide. John Biggins, A Sailor of Austria: In Which, Without Really Intending To, Otto Prohaska Becomes Official War Hero No. 27 of the Habsburg Empire (1991), a comic novel about U-boat crews during the waning of the Austro-Hungarian Empire; #1 in the Otto Prohaska series. John Biggins, The Emperor’s Coloured Coat: In Which Otto Prohaska, Future Hero of the Habsburg Empire, Has an Unexpectedly Interesting Time While Not Quite Managing to Avert the First World War (1992), a comic novel set in the last years of the Austro-Hungarian Empire; #2 in the Otto Prohaska series. John Biggins, Two-Headed Eagle: In Which Otto Prohaska Takes a Break as the Habsburg Empire's Leading U-Boat Ace and Does Something Even More Thankless (1993), a comic novel about a soldier during the last years of the Austro-Hungarian Empire; #3 in the Otto Prohaska series. John Biggins, Tomorrow the World: Tomorrow the World: In Which Cadet Otto Prohaska Carries the Habsburg Empire's Civilizing Mission to the Entirely Unreceptive Peoples of Africa (1994), a comic novel about Otto Prohaska’s early days as a soldier in the Austro-Hungarian Empire; #4 in the Otto Prohaska series. Louis de Bernieres, Birds Without Wings (2004), a literary novel about a Turkish village during World War I, the last days of the Ottoman Empire and the rise of Kemal Atatürk. Mark Helprin, A Soldier of the Great War (1991), an old man tells a young man the story of his life, interrupted by World War I, while they make a pilgrimage into the mountains outside Rome. Jack D. Hunter, The Blue Max (1966), about a ruthlessly ambitious German fighter pilot in the First World War. Sebastien Japrisot, A Very Long Engagement (1993), a young Frenchwoman, suspecting her fiancé may not have died in the war as reported, sets out to find him. Ariel Lawhon, Flight of Dreams (2016), about a female crewmember on the German airship Hindenburg. Daniel Mason, The Winter Soldier (2018), about an inexperienced Austrian medical student who enlists during WWI and is sent to a freezing outpost ravaged by typhoid with only a mysterious nurse to help him. Jojo Moyes, The Girl You Left Behind (2013), about a French artist who leaves his wife to fight at the front, where his portrait of her catches the eye of a German officer; and a present-day American woman whose husband makes her a gift of the portrait shortly before his sudden death. Kim Newman, The Bloody Red Baron (1995), historical fantasy in which Dracula supported the German Kaiser during WWI and vampires morphed into huge bats to engage in aerial dogfights. Aleksandr Solzhenitsyn, August, 1914 (1971), about the disorganized and badly-led Russian invasion of Prussia and Battle of Tannenberg at the beginning of World War I, which led to the Russian Revolution. Steven Weiner, The Yellow Sailor (2001), about a group of shipwrecked German sailors wandering through war-torn Europe. Robert A. Wright, Beyond Ultra (2011), about three German brothers, two serving in the German army while one attends an American university, during World War I, the Spanish Civil War and World War II; self-published. Henri Barbusse, Under Fire (1917), about French soldiers in the trenches of the First World War. Jean Giono, To the Slaughterhouse (1931), about the effect of World War I on a village in Provence. Jaroslav Hasek, The Good Soldier Svejk (1923), a satirical antiwar novel. Erich Maria Remarque, The Road Back (1931), about three German soldiers and their difficulties returning to civilian life after the war; sequel to All Quiet on the Western Front. Jules Romain, Verdun (1937), a novel about the Battle of Verdun based on the author's World War I experiences. Franz Werfel, The Forty Days of Musa Dagh (1934), about the resistance of the people in the Musa Dagh area during the Armenian Genocide. Ben Elton, The First Casualty (2005), a literary novel about a police inspector imprisoned for refusing the draft, and then released and sent to the midst of the war in France to investigate a murder. Anne Perry, No Graves as Yet (2003), about a Cambridge professor plunged into a mystery; set in the period immediately leading up to World War I; #1 in the World War One mystery series. Anne Perry, Shoulder the Sky (2004), a British army chaplain on the front lines in 1915 investigates a murder; #2 in the World War One mystery series. Anne Perry, Angels in the Gloom (2005), about a wounded army chaplain on leave in 1916; #3 in the World War One mystery series. Anne Perry, At Some Disputed Barricade (2006), a British army chaplain on the front lines in 1917 investigates a murder; #4 in the World War One series. Anne Perry, We Shall Not Sleep (2007), about a British army chaplain in 1918, the last year of the war; #5 in the World War One mystery series. Charles Todd, The Murder Stone (2003), a stand-alone mystery novel about a young British woman whose grandfather has been accused of murder. Charles Todd, A Test of Wills (1996), about a Scotland Yard inspector suffering from shell-shock assigned to investigate a case of murder in which the prime suspect is a friend of the Prince of Wales; #1 in the Ian Rutledge mystery series. Charles Todd, Wings of Fire (1998), about a Scotland Yard inspector suffering from shell-shock who goes to Cornwall to investigate three deaths in the same family; #2 in the Ian Rutledge mystery series. Charles Todd, Search the Dark (1999), about a Scotland Yard inspector suffering from shell-shock who must find out who murdered a woman and where her three missing children are; #3 in the Ian Rutledge mystery series. Charles Todd, Legacy of the Dead (2000), about a Scotland Yard inspector suffering from shell shock who investigates the case of a missing woman in Durham, Scotland; #4 in the Ian Rutledge mystery series. Charles Todd, Watchers of Time (2001), about a Scotland Yard inspector suffering from shell shock who investigates the murder of a priest; #5 in the Ian Rutledge mystery series. Charles Todd, A Fearsome Doubt (2002), about a Scotland Yard inspector suffering from shell shock who investigates an old case of serial murder; #6 in the Ian Rutledge mystery series. Charles Todd, A Cold Treachery (2005), about a Scotland Yard inspector suffering from shell shock who investigates a family's murder and tries to rescue a missing child, the only survivor; #7 in the Ian Rutledge mystery series. Charles Todd, A Long Shadow (2006), about a Scotland Yard inspector suffering from shell shock who is being stalked by an unknown person leaving machine gun cartridges as his calling card; #8 in the Ian Rutledge mystery series. Charles Todd, A False Mirror (2007), about a Scotland Yard inspector suffering from shell shock who must find a killer in a small town on the southern coast of England; #9 in the Ian Rutledge mystery series. Charles Todd, A Pale Horse (2008), about a Scotland Yard inspector suffering from shell shock who investigates a case of murder in an abbey ruin in Yorkshire; #10 in the Ian Rutledge mystery series. Charles Todd, A Matter of Justice (2009), about a Scotland Yard inspector suffering from shell shock who investigates a murder with roots that stretch back to a barbaric crime during the Boer War; #11 in the Ian Rutledge mystery series. Charles Todd, The Red Door (2010), about a Scotland Yard inspector suffering from shell shock who investigates the murder of a woman who painted her front door red in anticipation of her husband's return from the war; #12 in the Ian Rutledge mystery series. Charles Todd, A Lonely Death (2011), about a Scotland Yard inspector suffering from shell shock who investigates the case of three soldiers who survived World War I only to be murdered after they return to their homes in the English countryside; #13 in the Ian Rutledge mystery series. Charles Todd, The Confession (2012), about a Scotland Yard inspector suffering from shell shock who finds a dying man's confession that he killed his cousin five years ago during the war unbelievable; #14 in the Ian Rutledge mystery series. Charles Todd, Proof of Guilt (2013), about a Scotland Yard inspector suffering from shell shock whose new boss interferes with his investigation of the hit-and-run death of a wine merchant; #15 in the Ian Rutledge mystery series. Charles Todd, Hunting Shadows (2014), about a Scotland Yard inspector with traumatic memories of World War I who investigates the murder of a wedding guest which may have its roots in the war; #16 in the Ian Rutledge mystery series. Charles Todd, A Fine Summer's Day (2016), about a Scotland Yard inspector during the days before the outbreak of World War I, who is racing to solve a series of seemingly unconnected murders; #17 in the Ian Rutledge mystery series. Charles Todd, No Shred of Evidence (2016), about a police inspector who must sort out conflicting stories told by four young women and a farmer who claims he witnessed them attempting to murder a man boating on a Cornish river in 1920; #18 in the Ian Rutledge mystery series. Charles Todd, An Impartial Witness (2010), about a World War I nurse who becomes involved in a case of murder after she witnesses a woman at a train station saying goodbye to a man who is not her husband, one of the injured soldiers the nurse is bringing back to England; #2 in the Bess Crawford mystery series. Charles Todd, A Bitter Truth (2011), about a World War I nurse who returns to London on leave and becomes the suspect in a murder case after she helps a woman with a concussion; #3 in the Bess Crawford mystery series. Charles Todd, An Unmarked Grave (2012), about a World War I nurse who discovers the body of a murdered man among the dead from the influenza epidemic; #4 in the Bess Crawford mystery series. Charles Todd, A Question of Honor (2013), about a World War I nurse who, after a dying Indian officer revives her memory of a murder that happened during her childhood in India, travels there to investigate while she is on leave; #5 in the Bess Crawford mystery series. Charles Todd, An Unwilling Accomplice (2014), about a World War I nurse who accompanies a wounded soldier to a ceremony honoring him, and discovers him missing the morning after the ceremony; #6 in the Bess Crawford mystery series. Charles Todd, A Pattern of Lies (2015), about a World War I nurse who, while visiting a family in Kent, discovers that explosion and fire at the Ashton Gunpowder Mill may have been an act of murder; #7 in the Bess Crawford mystery series. Charles Todd, The Shattered Tree (2016), about a World War I nurse treating a wounded French officer who, in a moment of anger, shouts at her in German; #8 in the Bess Crawford mystery series. Charles Todd, A Casualty of War (2017), about a World War I nurse taking care of an experienced officer from Barbados with a head wound who insists his distant Englsh cousin shot him; #9 in the Bess Crawford mystery series. Charles Todd, A Forgotten Place (2018), about a nurse whose Welsh patients in a clinic for amputees worry her so much that she travels to a coal-mining village in Wales where she learns that a serial murderer is at work; #10 in the Bess Crawford mystery series. Jacqueline Winspear, Maisie Dobbs (2003), in 1929 London, a former World War I nurse working as a private investigator takes a case with roots in the war; #1 in the Maisie Dobbs mystery series. Jacqueline Winspear, Birds of a Feather (2004), in 1930 London, a female investigator takes a case with roots in the First World War; #2 in the Maisie Dobbs mystery series. Jacqueline Winspear, Pardonable Lies (2005), about a female investigator who takes a case with roots in the First World War; #3 in the Maisie Dobbs mystery series. Jacqueline Winspear, Messenger of Truth (2006), in 1931 London, a female investigator takes a case with roots in the First World War; #4 in the Maisie Dobbs mystery series. Jacqueline Winspear, An Incomplete Revenge (2008), a female investigator takes a case with roots in the First World War; #5 in the Maisie Dobbs mystery series. Jacqueline Winspear, The Mapping of Love and Death (2010), about a private investigator who, after being hired in 1932 to find the nurse who wrote love letters to a young soldier killed during World War I, discovers the soldier was murdered; #7 in the Maisie Dobbs series. Jacqueline Winspear, A Lesson in Secrets (2011), about a private investigator who accepts an undercover assignment from the British government to infiltrate a school founded by a pacifist, just before a staff member is murdered; #8 in the Maisie Dobbs series. Jacqueline Winspear, Elegy for Eddie (2011), about a woman psychologist whose investigation of the death of a fruit and vegetable seller leads to a pattern of lies and manipulation on a national scale; #9 in the Maisie Dobbs series. Jacqueline Winspear, Leaving Everything Most Loved (2015), about a woman psychologist whose brother asks her to investigate the death of an Indian immigrant after Scotland Yard fails to conduct a full investigation; #10 in the Maisie Dobbs series. Jacqueline Winspear, A Dangerous Place (2015), about a woman psychologist who impulsively disembarks in Gibraltar while on her way home from India to England, and becomes involved in investigating the murder of a Sephardic Jew; #11 in the Maisie Dobbs series. Jacqueline Winspear, Journey to Munich (2018), about a woman psychologist working for the British Secret Service who is sent to Hitler's Germany in 1938 to impersonate the daughter of a man the Germans have agreed to release from Dachau, provided a family member comes to get him; #12 in the Maisie Dobbs mystery series. Jacqueline Winspear, In This Grave Hour (2018), about a woman psychologist trying to find out who is murdering Belgian refugees from the Great War twenty-three years ago; #13 in the Maisie Dobbs mystery series. Jacqueline Winspear, To Die But Once (2018), about a woman psychologist investigating the disappearance of a young apprentice working on a secret government contract in the spring of 1940, as World War II begins and thousands of soldiers are stranded on the beaches of France; #14 in the Maisie Dobbs mystery series.